Wider, larger, and closely related to the Leap Chair, the Leap Chair Plus by Steelcase is the heavy-duty ergonomic chair for the ages. Using state-of-the-art LiveBack technology, this dynamic chair comforts and conforms to your body where you need it most - your back - and supports up to 500 pounds easily. The Steelcase Leap Plus works by way of a uniquely-supportive back that recognizes the independent movement of your upper and lower back, which is ideal for a wide range of sitting postures. With a 18% larger seat cushion and a 18% larger back, you'll have the chair that supports ideally, fitting to you and never forcing you to fit in it. The end result is a seating experience that changes as you shift positions throughout the day, leading to more comfortable work you have to feel to believe. Overall chair height 38.75" - 42.5"
Width between arms 20.5" - 24.5"
The Steelcase Leap Chair Plus is available in your choice of a black or platinum. 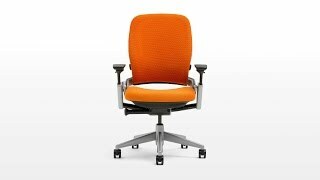 The Steelcase Leap Chair Plus is available with or without arms. There are some applications where arms get in the way of tasks. For computer users we recommend Steelcase arms because they're some of the best on the market and they can lower to about thigh level. The highly adjustable arms move in and out, forward and back, up and down and pivot, so you can find the exact position for optimal support and comfort. Yea, it's a LOT of money for a chair. But $500 for the last one rated 50lbs more than i needed was trash inside 2 months and it took 8 weeks to get a replacement part. the service from the human solution was phenominal as well. now - the chair. I LOVE IT. it's got more options than a 20 year microsoft employee and very well built. well worth the money. i notice an improvement in my back and shoulder pain and that alone makes this chair worthwhile. and look at it - it seems to be smiling at you! $1,469.00 List Price: $2,332.00* The list price is the same as the MSRP (Manufacturer's Suggested Retail Price). It may not necessarily be the price at which the product is sold.